Most species have large, muscular females, ca. 1 m or more in total length, that occupy surface waters of tropical and subtropical oceans. In females the dorsal and dorsolateral arms are distinctly longer than arms III and IV and are connected by an extensive web which is absent from the other arms. Figure. T. violaceus swimming just above the shallow ocean floor. Note the string-like structure trailing from the broad web of arm I. This "string" is actually the slender arm I extending beyond the web. Posterolateral view of T. violaceus swimming just above the shallow ocean floor. Photographed by Rob Rush at 68 feet deep off Delray Beach Ledge, Florida, USA (near 26°N 80°W), May 12, 2001, 9:06 AM local time. Figure. Same individual of T. violaceus pictured above, showing web and ocelli on arm I. Photographed by Rob Rush. The color phase most typically associated with T. violaceus is with silvery sides and a very dark purple/blue dorsal surface. Figure. The picture of T. violaceus on the left, taken in an aquarium, shows the typical color pattern. Photograph taken by Vicente Hernandez. 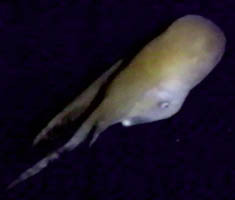 The photograph on the right of Tremoctopus sp. taken from a submersible shows the octopod swimming at a depth of 340 m and about 5 m above the bottom in Hawaiian waters. An AVI format video clip of this individual is available at Cephalopods in Action. Submersible photograph courtesy of the Hawaii Undersea Research Laboratory. with extensive web between dorsal four arms; web virtually absent between other arms (females). Dorsal four arms (arms I and II) much longer than ventral four arms (arms III and IV). Deep web present between dorsal four arms (see title photograph). Hectocotylus develops in sac burried beneath right eye. Proximal half of hectocotylus with papillate lateral fringes. Figure. Hectocotylus of Tremoctopus violaceus.Top - Oral view of the hectocotylus still attached to the male. Bottom - Median section through the distal end of the hectocotylus with an empty spermatophore receptacle. Drawings from Naef, 1921-3. Radula: First lateral teeth of radula much smaller than rachidian or second lateral teeth. Figure. View of a portion of the radula of T. violaceus.Drawing from Naef (1921-1923). Hydrostatic organ (swim bladder) present dorsal to digestive system. Present at base of dorsal and ventral arms. Figure. Two views of a swimming T. violaceus showing water pores (arrows). Left - View of the dorsal water pores. Right - View of the ventral water pores. Photographs by Peter Wirtz. The presence of a hydrostatic organ was recently reported by Bizikov (2004). A list of all nominal genera and species in the Tremoctopodidae can be found here. The list includes the current status and type species of all genera, and the current status, type repository and type locality of all species and all pertinent references. Tremoctopus violaceus gracilis (Eydoux and Souleyet, 1852). 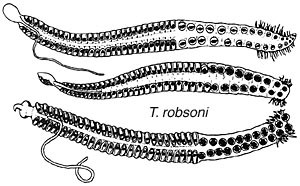 becomes Tremoctopus gracilis (Eydoux and Souleyet, 1852). There is some confusion on the proper name of T. robsoni. 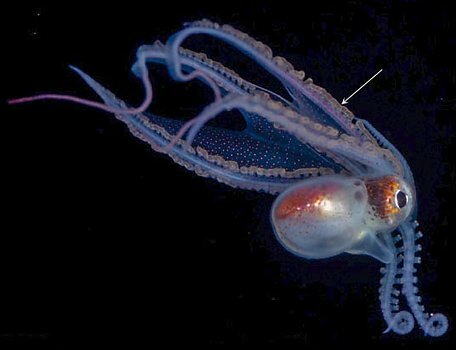 Mike Sweeney (USNMNH) explains: "The name Tremoctopus robsonianus is in the title of the paper (an abstract from a meeting of the Wellington Philosophical Society). However the taxon is introduced in the text with the name Tremoctopus robsoni n.sp. The taxon was published in the 1883 volume (#16) of the Transactions of the New Zealand Institute, but had a publication date of May 1884." The correct name is Tremoctopus robsoni Kirk, 1884. Of the four recognized species, T. gelatus is easily recognized by its gelatinous consistency and generally pale pigmentation, the other three species are very similar. The most useful character is the number of sucker pairs on the distal half of the hectocotylus of the male. Another character is the number of gill filaments on the outer demibranch of the gill not including the terminal filament. Figure. Left - ventral and dorsal views of T. gelatus, 328 mm ML, from Thomas, 1977. Drawing printed with the Permission of the Bulletin of Marine Science. Right - Dorsal view of T. robsoni, 61 mm ML. Drawing from O'Shea, 1999. A few additional features on the hectocotylus seem to have specific value. The proximal suckers number 22-23 pairs in T. violaceus, 27-29 pairs in T. gracilis (Thomas, 1977) and 9-15 in T. robsoni according to the figures shown here from O'Shea, 1999. Also the hectocotylus of the first two species has a fringe of fleshy papillae that extend the full length of the proximal section, while the third species, according to the illustration, has the fringe restricted to the base of the proximal section. Figure. Oral views of three hectocotyli of T. robsoni. Drawings from O'Shea, 1999. Young individuals carry broken tentacles of cnidarians, frequently the Portuguese man-of-war (jellyfish), using the suckers of the dorsal four arms. The borrowed tentacles, which have stinging cells, presumably have a defensive and/or offensive function. Males are dwarfs (15 mm ML), often reaching only 5-10% of the female size. The females carry numerous (100,000 to 150,000) small eggs (0.9 X 1.5 mm in size). The eggs are attached to a secreted sausage-shaped rod held at the base of the dorsal arms and carried by the female until hatching. The hatchling has the arm bases in a cuff as in Argonauta. Data are from Thomas (1977) and Naef (1921/23). More information of the brooding female, the egg mass, embryos and hatchlings can be found here. T. violaceus lives in the Atlantic and T. gracilis in the Indo-Pacific; T. gelatus is a deep-living, gelatinous, presumably mesopelagic, species that is cosmopolitan in tropical and temperate seas (Thomas, 1977). T. robsoni is known from waters off New Zealand (O'Shea, 1999). Bizikov, V. A. 2004. The shell in Vampyropoda (Cephalopoda): Morphology, functional role and evolution. Ruthenica. Supplement 3: 1-88. Naef, A. 1921-23. Cephalopoda. Fauna und Flora des Golfes von Neapel. Monograph, no. 35. English translation: A. Mercado (1972). Israel Program for Scientific Translations Ltd., Jerusalem, Israel. 863pp., IPST Cat. No. 5110/1,2. O'Shea, Steve. 1999. The Marine Fauna of New Zealand: Octopoda (Mollusca: Cephalopoda). NIWA Biodiversity Memoir 112:280pp. Thomas, R. F. 1977. Systematics, distribution, and biology of cephalopods of the genus Tremoctopus (Octopoda:Tremoctopodidae). Bull. Mar. Sci. 27: 353-392. 1 mile east of Pompano Beach, Florida. Illustrations from Thomas (1977) printed with the Permission of the Bulletin of Marine Science. Page: Tree of Life Tremoctopodidae Tryon, 1879. Tremoctopus Chiaie 1830. 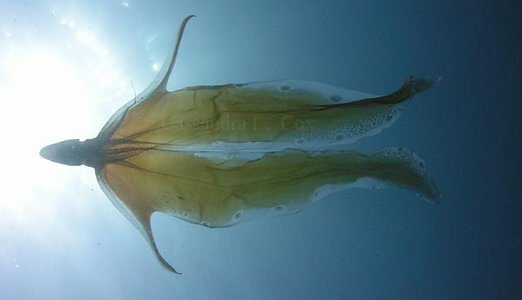 Blanket octopus. Authored by Katharina M. Mangold (1922-2003), Michael Vecchione, and Richard E. Young. The TEXT of this page is licensed under the Creative Commons Attribution-NonCommercial License - Version 3.0. Note that images and other media featured on this page are each governed by their own license, and they may or may not be available for reuse. Click on an image or a media link to access the media data window, which provides the relevant licensing information. For the general terms and conditions of ToL material reuse and redistribution, please see the Tree of Life Copyright Policies.